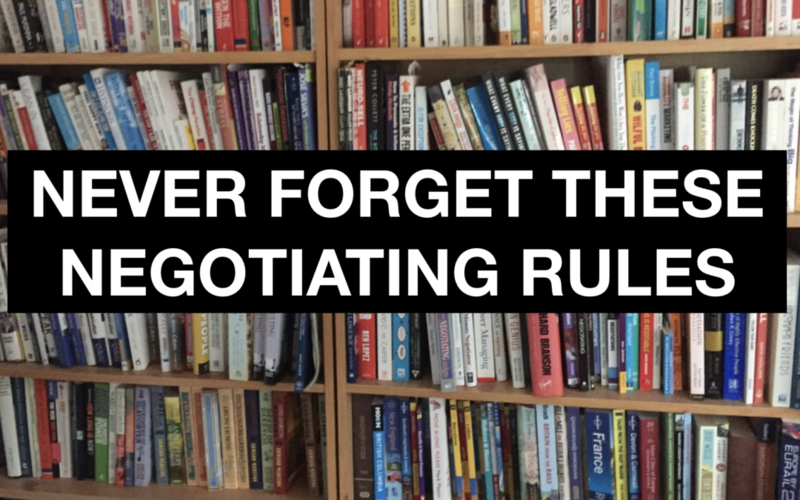 When negotiating, presenting or influencing, knowledge is power. However it is the focused use of that knowledge that creates the real power. If you don’t use it correctly, at the right time and in the right way, all your effort and energy can be wasted. Never forget, these reminders. Yesterday I had a conference call with a client and their team, as a follow up to a Negotiation Masterclass we ran in the Netherlands. 1 – Don’t split the difference, when you could SPLIT 70/30 or similar. Often people say go 50/50 when they are in a weak position. Why, because that is better than their walk away position. 2 – Any negotiation team needs to be prepared and targeted on the common goal. Often our own people can have personal agendas which might not be totally focused on the common good. Check in that all the goals and objectives are the same at your briefing meeting. So many times people tell me that they don’t have a briefing meeting before an important negotiation. I have to say this is madness. You spend all your time selling your goods. Then the client negotiates on price or the extras (the variables) and you and your people are unprepared. a – It structures the meeting in the order you want! b – It highlights in your minds eye the key issues! c – It shows the other side how professional you are! Never forget to put the difficult issues about two-third of the way through the agenda. Good luck with your negotiating. Never go alone.